The major attraction within the line-up no doubt is that of vocalist Rose Podwojny, who constantly balances between the raunchy approach of a Grace Slick and that of an authentic Jazz diva. Others have placed her voice in between that of Linda Hoyle and Julian's Treatment singer Cathy Pruden. Based around the talented guitarist Jean-Pierre Alarcen, Sandrose rose out of the ashes of another French cult band called Eden Rose. Whilst mellotron and Hammond are to be found throughout the lengthy instrumental passages, most of the attention goes towards Rose Podwojny, who has often been compared to Dutch singer Jerney Kaagman, whilst from a musical perspective Sandrose was often compared to Earth & Fire, Kaagman's band. To my ears, Rose's voice sounds much more trained, with more vibrato and able to shine in many other musical styles, something we can't say from the rather limited voice of Jerney Kaagman. Also, from the point of view that this concerns a French band, Rose's prononciation of the English language is perfect. No doubt the highlight of this album has to be the unrivaled prowess of "Underground Session," which really contains every single element from the book of symphonic rock highlights. This track alone is worth the money of the entire album. It nicely alternates calm passages and more heavy outbursts in order to create the true identity of authentic prog. The dreamy "Summer Is Yonder" could well be an outtake from Focus or Pulsar, once again not being obtrusive in any way and fully composing the arrangement in favour of Rose's high pitched vocals here. Although the song has a slight medieval feel at times, it's mainly the Akkerman-like guitar from Alarcen combined with the organ that delivers the Focus likeness. When Rose isn't singing, the rest of the band most definitely prove that they are also outstanding musicians, leaning heavilly towards jazz and fusion as demonstrated during the rhythmic "Metakara," displaying the typical Hammond from the seventies. All in all, this still is a wonderful album to listen to even though it has been released more than thirty years ago. Some of the sounds may be dated but the way the compositions are made still vouch for great creativity. Chauvinistic as they are, the French rate this album as being one of the world's top ten progressive albums of all time. 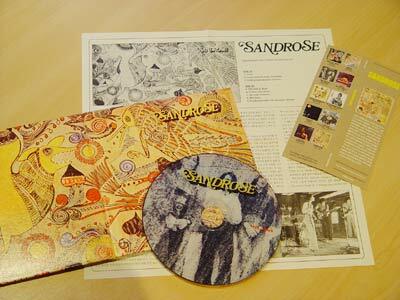 I wouldn't go as far as saying top ten but it most definitely merits a place in the world's best 100 prog albums of all time, and that alone is a fantastic achievement, knowing there are thousands and thousands of albums out there whilst Sandrose only made this single debut. Jean-Pierre Alarcen went on to release two solo albums whilst Rose Podwojny changed her name to Rose Laurens, releasing several chart topping singles in France. She even sang on the French soundtrack of Les Mis?rables, whilst she had a major hit with the disco track "Africa." Once again, the Korean M2U records has done a splendid job in re-issuing this long forgotten gem in a miniature sleeve whilst also including a lengthy text ? in Korean!